Title : Application title that will be displayed in the toolbar. Friendly URL : This field allows you to customize the URL that will be called by the application, the allowed characters are the same available on regular URLs: a-z, A-Z, 0-9, -_. This option can also be changed within Scriptcase Home interface, on the “Friendly URL” column from the applications grid. Organization : Allows the applications to run inside folders via iframe or embedded on the tabs application. Folder on the Top : Displays the folders above the application. Folder on the Bottom : Displays the folders below the application, next to the footer. Folder on the Left : This option allows the folders to be aligned in the left, like a vertical menu. Folder on the Right : This option allows the folders to be aligned in the right, like a vertical menu. Menu on the Top : This option is similar to “Folder on the Top”, but its visual schema has the menu style. Menu on the Bottom : This option is similar to “Folder on the Bottom”, but its visual schema has the menu style. . Menu on the Left : This option is similar to “Folder on the Left”, but its visual schema has the menu style. Menu on the Right : This option is similar to “Folder on the Right”, but its visual schema has the menu style. Side by Side : Display all applications in folders, one next to the other. Table Width : Main table size. Measure Unit : The unit used by table size. It can be: Pixel or percentage..
Tab Alignment : This option sets the tab alignment position. It can be: center, left or right. 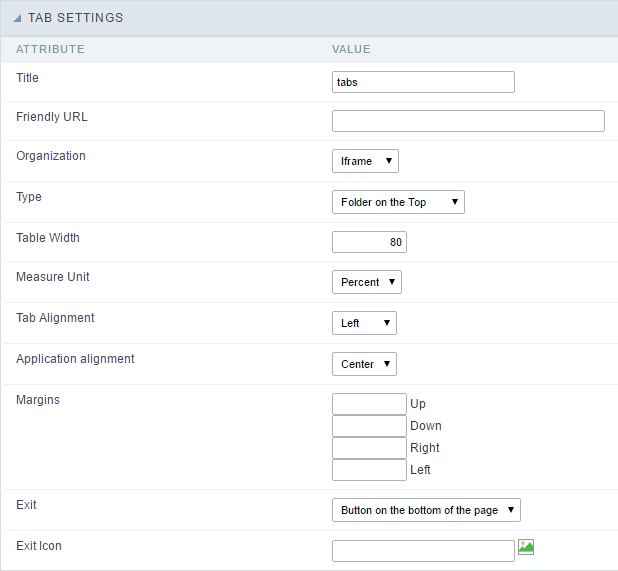 Application alignment : This option sets the application alignment position, It can be: center, left, or right. Exit Icon : This option allow you to select an icon for the “Exit” option in the tab. Use the image manage to select or import a customized image.